China and the United States are the two countries with the most energy-related carbon dioxide (CO2) emissions, together accounting for about 40% of global emissions in 2012. Late last year, China and the United States each announced intended nationally determined contributions (INDCs) to mitigate their respective greenhouse gas (GHG) emissions, but there is still uncertainty in each country's ability to meet those targets. Further efforts to reduce GHG emissions will be discussed at the upcoming United Nations Climate Change Conference in Paris. The United States, which had previously set a goal of reducing GHG emissions by 17% from 2005 levels by 2020, has proposed in its INDC to bring emissions 26% to 28% below the 2005 level by 2025. China's INDC proposes to achieve the peaking of its CO2 emissions around 2030, making best efforts to peak early. China's INDC also proposes 20% non-fossil energy use in that year. Additionally, on September 25, China announced its intent to expand the seven regional emissions trading programs to a national cap-and-trade program that begins in 2017, although specific emissions caps and other policy details have yet to be announced. In the United States, about 80% of all CO2 emissions in 2012 were related to energy, with the remainder attributed to sources such as cement production, agricultural activities, land use changes, and forestry. 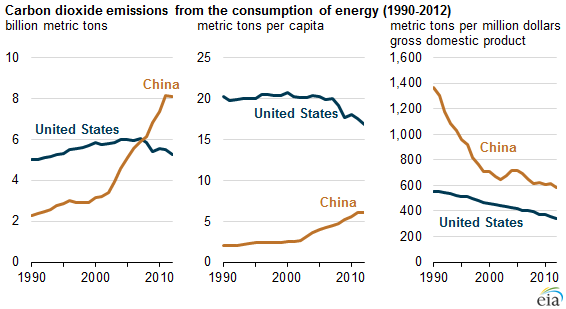 China surpassed the United States as the world's largest CO2 emitter in 2008. In 2012, China's per capita CO2 emissions were about one-third the U.S. level, while its emissions per unit of economic output were about 70% more than the United States. In the United States, two of the largest sources of energy-related CO2 emissions are the transportation and electric power sectors. For transportation, the main mechanism for reducing emissions is the increasing stringency of fuel economy and GHG emissions standards, both for light-duty vehicles and heavy trucks. For electric power, the U.S. Environmental Protection Agency (EPA) finalized the Clean Power Plan (CPP) that is aimed at significantly reducing CO2 emissions from existing fossil-fueled generators. In China, the ultimate achievement of emissions targets will depend on its need to balance environmental goals with economic growth and development. Chinese energy demand growth has historically been driven by five-year planning cycles and has centered mainly on industrial energy demand. China is still industrializing, and its energy needs will grow despite slowing economic growth and a shift to less energy-intensive industries. China's energy mix is dominated by coal, the most carbon-intensive fossil fuel, and will likely remain so for the foreseeable future. If total CO2 emissions are to peak near 2030, coal consumption would need to stop growing and perhaps decline substantially between 2015 and 2035 unless carbon capture and storage (CCS) technology, a relatively nascent technology, is rapidly adopted. As per capita income increases, China's growing middle class is expected to increase its demand for energy services, and China's balance of energy use by sector will continue to shift from industry to the building and transportation sectors. Chinese transportation and building technologies have seen improvements in energy efficiency in recent years that should help China curb its growth in energy use.